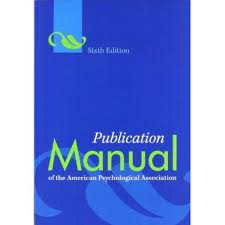 The Publication Manual of the American Psychological Association includes standards for formatting a paper, for correct usage, and for citing references. Click on the book image to check your library for copies. This is an actual template of an APA paper. Download to use. Author. (Year of Publication). Title. Publisher information. Example: Smith, B. (1943). A tree grows in Brooklyn. New York, NY: Harper Collins.